At one time, and probably not so long ago, the setting of this church must have been quite something. It is situated at a distance from its village, beside an old farm, and away from the road. But today, the patchwork of land around has been thoroughly domesticated by its sale for ranch-style housing. The churchyard itself is still wonderfully wild, although one must cross private land by a footpath to reach it. Externally, St Michael and St Felix looks quite unlike any other Suffolk church, especially as you approach it from the west. The truncated tower is reminiscent, in proportion, of the unfinished tower at nearby Uggeshall, which was planned on the eve of the Reformation, but never built. This, however, is something much older. It is 13th century, and is complete. That it is so different in style to other Suffolk churches is probably due to the fact that this was the church of a Benedictine priory. It was founded shortly before the Norman conquest. 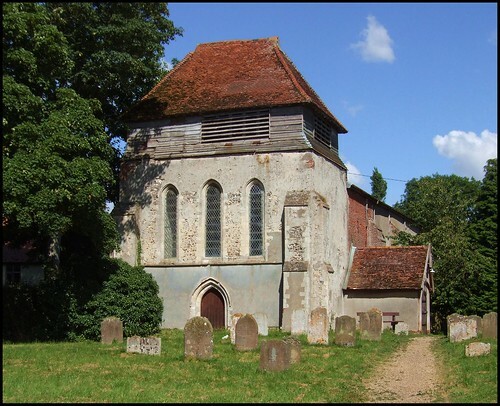 It had chapels at Wissett and Spexhall, both surviving as parish churches. Within 50 years of its foundation, Rumburgh Priory had passed into the ownership of St Mary's Abbey, York, until Cardinal Wolsey sequestrated it in 1528 for funds to build his college at Ipswich. As you approach the south porch, a small gate leads off to the east. On my first visit, some ten years ago,I went through this, hoping to get a shot from the east. I found myself on trim lawns, with glasshouses and cucumber frames. It wasn't until I had walked around the church, and came across a family eating their lunch under an umbrella, that I realised I had strayed into a private garden. They were very polite under the circumstances. A couple of correspondents have told me that they have found this church locked, but I think it was simply that it has a very stiff door handle. It took me a couple of goes to get it open. Coming back in 2008, I stepped inside to what I had remembered as a cold, sober silence. The walls are austere, the dark screen awesome. I think that if I sat in this church every Sunday, it would make me a very serious person. The screen must have been a gorgeous one in its day. Now, it is hidden under thick, brown varnish, but there is still surviving gesso-work (moulded plaster applied to wood before painting) underneath this. There is still some surviving evidence of the community life of this building. The priory arms hang at the west end, and an apparent priest door in the north wall of the chancel was the door the monks used as they came in and out of the priory buildings, which were to the north of here. The windows in the north wall, which seem to belong to no architectural period, were probably punched through in the 17th century after the demolition of the other buildings. A squint and a blocked window in the north chancel wall indicate that once the altar could be watched from other rooms in the complex. A reminder of religious enthusiasms of some four centuries later is a label on the side of the organ, asking us to Pray for the Soul of James Halliburton Young, Priest, Rector of Shipmeadow 1894-1904. Such an apparently un-Anglican sentiment was typical of the enthusiasms of the early 20th Century Anglo-Catholic movement within the Church of England, of which the now-redundant church at Shipmeadow was a hotspot. Presumably, the organ was moved here when the church there became a private house. Sam Mortlock quotes in full the epitaph for Eliza Davy, set in stone on the floor. So I shall do the same: She once the fairest flower in May, now turned to lifeless clay; Good God, what can we say? He calls, we must obey. It seemed a fitting memorial for this rather sad place. Some Suffolk churches have a timelessness about them, a sense of continuity. But here is a church in which a sense of the past pervades all. To sit here is to be surrounded by ghosts, by stone-cold age. There is much to be impressed by here. But it was rather a relief to step outside, back into the sunshine, and the birds singing in the graveyard. Back into to the 21st century.